Our last newsletter led with “Good Summer Reads,” announcing the imminent arrival of two new Rideau books. 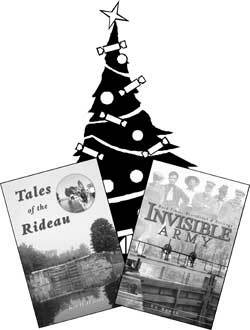 Well, they are here, they are both excellent reads, and if you’re looking for a Christmas gift for the Rideauphile in your family or just someone who has any sort of interest in Canadian history – you can do no better that giving them a copy of Invisible Army and/or Tales of the Rideau. Both of these books explore new ground in Rideau history. Ed Bebee’s Invisible Army tells the story of the people who have operated the canal since 1832. Ken Watson’s Tales of the Rideau contains 17 non-fiction stories, exploring facets of Rideau history through a combination of the tale and the back-story behind the tale. Both books are guaranteed to reveal to the reader new historical facts about the Rideau in an interesting way. And with the Rideau, you can go out today and see the setting of much of this history – so these books will encourage more people to get out and explore the Rideau. The books have been very well received this summer. Friends has been out at a number of events (see “Friends’ Summer Roadshow” in this newsletter) with these new books and the many other Rideau books that we offer. There is a genuine interest in Rideau history among members of the public and we’ve had many interesting conversations with people who have been fascinated with various aspects of Rideau history. Some of these conversations have even sparked ideas for new avenues of research – there are a lot more Rideau stories waiting to be told. I hope you had as pleasant a summer as I did, visiting favourite sites along the Rideau Canal. We need to be concerned about climate change but if one consequence is warm sunny summers, it is difficult to crank up one’s anxiety level. We had an enjoyable annual meeting at the Legion Hall in Merrickville on May 8, one of the rare rainy days in the early summer. As well as the usual annual meeting business we had the pleasure of a talk by Professor Brian Osborne on “The History of the Rideau Canal since 2007 – Global and Local Developments.” Brian provided some very interesting insights into the challenges faced by World Heritage Sites which extend over long stretches of territory, as is the case for the Rideau Canal, the Douro Valley in Portugal and Hadrian’s Wall in Britain. We were also pleased to have Don Marrin, the new Superintendent of the Rideau Canal, join us for the meeting. The members of the executive have been active on behalf of Friends of the Rideau over the last four months. With the assistance of the Ontario Job Creation Program we were able to engage a coordinator for a number of weeks to work with us and the Rideau Heritage Network on several projects and to help the Network publish two newsletters plus organise its annual meeting. The coordinator also helped us with the development phase of a Rideau Waterway Speakers Bureau, a project which we hope to move forward in the coming months. We plan to seek further support from the Ontario government through this program to allow Friends to hire a coordinator in 2011 to work at our office in Smiths Falls and support projects consistent with our mandate. In a multi-stakeholder discussion in May, Friends was invited by Parks Canada Rideau Canal management to contribute input to the planning stage for the revisions to the Canal Management Plan. Throughout the summer we have been encouraging Parks Canada Rideau Canal Office to make the process to mobilize the Rideau Landscape Study as open as possible and to communicate extensively and regularly with the public. Elsewhere in this newsletter you will read Ken Watson’s opinion on the Landscape Strategy, views which a number of you likely share. Finally, with respect to public policy development and the Rideau Canal, Friends will be making a submission to the Ontario government during the consultations for revisions to the Provincial Policy Statement on Planning. The issue we will raise is the need to provide adequate protection in any new Policy Statement for World Heritage Sites in the province. Enjoy the autumn along the Rideau and, as part of your preparations for winter, why not buy a book or two from the selection available online at Friends of the Rideau. Our 2010 AGM was held on May 8, 2010, at the Legion Hall in Merrickville. We were very pleased to have had a special guest speaker, our very own Brian Osborne, Professor Emeritus at Queen’s University. Chair Hunter McGill reviewed the year for Friends. He noted that we were very active at various local events including the Rideau Canal Festival in Ottawa and the Classic Boat Show at Long Island. Our Books on CD project is moving right along with seven Parks Canada research reports now available in this format. Our retail outlet and interpretive centre in Merrickville, the Depot, had a good year (considering the economy). Hunter also noted that FoR directors, Ed Bebee and Ken Watson, were set to launch brand new Rideau history books. Brian Osborne gave an engaging talk “The History of the Rideau Canal since 2007 – Global and Local Developments.” Brian looked back over the last three years at issues and developments affecting policy and practice throughout the Rideau Corridor. As with all of Brian’s talks, it was both interesting and educational. Directors: Ed Bebee, David Brett, Mark King, Josephine MacFadden, Brian Osborne and Ken Watson. We had a good summer at our outlet and interpretive centre, The Depot in Merrickville, this year. The Depot underwent a makeover this spring under the direction (and hard work) of FoR directors Cheryl Gulseth, Hunter McGill and Rowena Cooper. Cheryl Gulseth did a fantastic job of looking after the organization and operation of the Depot (three cheers!!!). She also introduced several new products including; postcards, hoodies and golf shirts. In addition, we carried the new Parks Canada boat pennants, which are being used as a fundraiser for the beautification of southern sector lockstations. We only received grant funding for a single summer student and were very glad to have Kyla Mouré (who was with us last year) return to help us out. Parks Canada also very kindly shared some of the time of their student, Sarah Byford, who did a fantastic job at helping us with both sales and interpretation. We also had the help of several volunteers including Charla Smith, Ed and Lucy Bebee, Hunter McGill, and Katie Phillips. Thanks to all! Also a big thanks to Apollo Computers of Smiths Falls for loaning us a flat screen TV and helping us create a photo slide show for visitors to enjoy. Lockmaster Bill Glover was watching over us and helped us out with several issues (including fixing toilet floods) over the summer. Thanks Bill! We also thank Parks Canada for coming to the rescue of The Depot itself (a heritage building which they own) – doing needed roof and floor repairs to the structure. This fall they have been doing some outside painting and repairs – so it should be all set for next spring. Has Parks Canada Lost Its Way on the Rideau Canal? One of the things I love about the Rideau Canal is that its heritage is tangible. You can read Rideau history and then go out and actually see and touch that history. This is rare for Canadian historical sites and one of the reasons the Rideau Canal is now a UNESCO World Heritage Site. A number of significant issues have arisen in the last few years, however, that make me question whether Parks Canada is responsibly looking after the Rideau Canal World Heritage Site and pro-actively helping to enhance and promote the heritage of the Rideau Canal. These issues include lack of public input, lack of public communication and lack of support for the heritage of the Rideau Canal. Part of the problem with the latter is that there is, in fact, no one directly responsible for the heritage of the Rideau Canal in the management structure of the Rideau Canal Office of Parks Canada. More about this later. There are a number of issues surrounding heritage presentation at the locks. An example of this is Jones Falls where the full view of the dam and the view to and from Sweeney House are obscured by vegetation (and so are very poorly presented from a heritage point of view). In the fall of 2007, with a bit of prodding and the great co-operation of some individuals in the Rideau Canal Office, action was taken at Upper Brewers, Davis and Jones Falls. The required ecological evaluation was completed at all three sites, brushing was done at Upper Brewers and Davis and some very limited cutting done at the Jones Falls dam. But it’s now three years later and the further work required at Jones Falls has not been done. It’s a straightforward simple issue of heritage viewscapes that is not being addressed by Parks Canada. Another issue is the lack of public input. Starting in late 2007, the Rideau Canal Office seems to have sealed itself off from public input. The Superintendent used to have an advisory panel (the Rideau Canal Advisory Committee) made up of members of the public with various backgrounds (business/tourism, ecology, heritage). Originally formed with the creation of the first management plan (mid-1990s), it provided a method for the Superintendent to hear issues and views from those outside of government. As someone who attended those meeting for 10 years, I can personally say that I think it was very valuable for the Superintendent to get these kinds of candid views. The group would meet at least 4 times a year - its last meeting was in the fall of 2007. Still on the topic of public input, readers of this newsletter will know that my current peeve is the lack of public input into the Rideau Corridor Landscape Strategy. There was supposed to be a community advisory committee as a mandatory part of the new governance structure (agreed upon a year ago). It still doesn’t exist and the flawed Terms of Reference of the current, all-government, steering committee is an example of what happens when government moves “ahead” with no public input. If one of the aims of the Landscape Strategy is to gain public support for careful, sensitive management of the waterway, then an open, transparent process is essential. There is also a lack of public communication, specifically, public outreach. As a waterfront landowner and active member of my local lake association, I can attest to the fact that we don’t hear from Parks Canada. As an example of what can be done, several years ago the Rideau Canal Office did produce a series of informative brochures detailing some of the shoreline regulations (shoreline stabilization, docks, boathouses) in easy to understand language, with suggestions for best practices. Parks stopped producing the brochures when the person who created them retired, but the brochures are so good that I’ve been maintaining them on both my Rideau website and the Friends of the Rideau website. I’m a big believer in public communication, especially when it comes to natural and cultural heritage. Parks Canada should be doing much more of this. The most recent issue is Parks Canada turning down Friends of the Rideau’s request to have Parks acquire our new Rideau Waterway books (Invisible Army and Tales of the Rideau) for distribution this year to Rideau Corridor centres of learning (municipal libraries, high school libraries, university libraries). This program has been very successfully done in the past with other Rideau books (i.e. Sweeney Diary, Building the Rideau Canal) and is by every definition a win-win for both Parks Canada and Friends of the Rideau. For Parks, it is a very small expenditure that directly serves their charter which states in part, “We are storytellers recounting the history of our land and our people – the stories of Canada.” Well, apparently not on the Rideau Canal. The decision to turn us down is not actually a matter of money, it’s a matter of budget priorities. What they’re telling Friends is that every expenditure item in their current budget is more important than putting new heritage information about the Rideau Canal into local libraries. I simply find that very hard to believe. I could go on, but I don’t really mean for this to be a laundry list of the many issues (and I have a list, which includes such items as why there is no acquisition policy for the library in the Rideau Canal Office or why one of the most significant underwater archaeology sites on the Rideau remains scientifically undocumented). So, I’ll conclude by coming back to the question of “who is in charge of heritage?” The Rideau Canal Office (in fact all of Parks Canada) has been undergoing a very slow and painful re-structuring process. From what I’ve gleaned of the new structure – and it hasn’t been shown to me – the top of the heap in the Rideau Canal Office are the Superintendent, the Director of Operations, the External Communications Manager and the Visitor Experience Manager. Perusals of the publicly available information about these positions shows heritage to be in short supply. I will end on the positive note that, on the Rideau Canal, we’re starting from a high benchmark. Parks Canada does do some things very well. We have excellent front-line staff at the locks which translates to a great visitor experience. When I arrived on the Rideau in 1995, there was no signage at most locks – today there is signage at every station, providing the public with a bit of heritage information about the lock. The few interpretation programs Parks does, it does well. Parks has also supported some of Friends’ initiatives in this regard such as our How A Lock Works brochure. The more we can get the public interested in the fascinating heritage of the Rideau Canal, the more public support we will get, including higher visitor numbers. Friends uses its limited resources and huge amounts of volunteer effort to promote the heritage of the Rideau Canal. But, we’re now a World Heritage Site and Parks Canada has to step up and start paying more direct attention to heritage as part of its core management of the Rideau Canal. In early 2009, a committee (which had a balance of government and community members) was struck to craft a request for proposal to have a visual values study done. That work stopped in mid-2009, when some government people complained that they weren’t represented at the table. So, in September 2009, a new governance model was hammered out with a decision to create an all-government steering committee with, initially, two advisory groups - a technical advisory group and a community advisory group. The identification of respective mandates and goals for planning and development within the Rideau Canal Corridor. The identification of development opportunities and challenges for the Rideau Canal Corridor. The development of a series of next steps for moving toward a coordinated approach to planning in the Rideau Corridor. The agreement on an approach to the corridor study recommended by the World Heritage Committee and the cooperation on its development and implementation. To provide clarity, certainty and transparency in planning and development processes for decision makers, property owners and other stakeholders. Item 4 is the closest to addressing the ICOMOS recommendation. Protecting the visual values of the Rideau Canal is notable by its absence. I don’t dispute that the current government steering committee has considerable merit. It’s said to be a milestone to actually have all the governments along the Rideau Corridor talking about co-ordinated planning and development (although a bit of a sad commentary about inter-government communication and co-operation when this is considered to be a milestone). Perhaps this committee should continue with that work and a new committee be struck (or even the original committee re-struck) to actually deal with the issue of identification and protection of the visual values of the Rideau Canal World Heritage Site. In the meantime, the current steering committee and Parks Canada Secretariat continue to move “ahead” with no public input. At a recent Rideau Heritage Network meeting, our Chair, Hunter McGill, used the quote “when all is said and done, more is said than done” to sum up his feelings about the progress of the current committee. I concur. The Rideau Heritage Network (RHN) is a network of heritage professionals and volunteers who play a key role in the conservation of the cultural heritage resources of the Rideau Canal Corridor. In September, it held the first public meeting in several years. Attendees were interested to hear Brian Osborne, Professor Emeritus of Queen’s University, Kingston, give an updated version of his talk entitled The History of the Rideau since 2007 – Global and Local Developments. He was followed by Mayor Doug Struthers of Merrickville, who chairs the Steering Committee for the Rideau Corridor Landscape Strategy. Mayor Struthers outlined the progress of the Steering Committee to date and emphasised the need for slow and careful progress. Chris Smith, from Parks Victoria, Australia, who has been in Canada on an exchange program with Parks Canada, then presented his research paper for the Landscape Strategy. During the past few months, Chris has been researching the location, titles and subjects of as many research papers on the Rideau Corridor as he could find, and he came up with a truly astounding number. The final session in the afternoon consisted of a panel of speakers discussing the Rideau Heritage Network entitled, Where Do We Go From Here? The panel consisted of Brian Osborne, Mayor Struthers, Heather Thomson from Parks Canada and Sally Coutts, Heritage Planner from the City of Ottawa. The panel was moderated by Manuel Stevens, Chair of the Rideau Heritage Network. Following the panel discussion a lively exchange between the audience and panel members took place, with several ideas for future activities being put forward. At the end of the day a temporary farewell was said to Heather Thomson, who was about to go on maternity leave and we welcomed Susan Millar, a former RHN intern, who will be taking Heather’s place at Parks Canada while she is away. With the great sunny summer we had this year, members of the Friends’ board were on the road a fair bit. Not every event took place in warm and dry conditions, but for the most part it was better than 2009! We managed to get to the Authors’ Festival in Perth, the Westport Heritage Festival, the Rideau Waterway Land Trust Summer Festival in Newboro, the Rideau Canal Festival in Ottawa and the Manotick Classic Boat Show. As well, on July 11, at The Depot in Merrickville, our star authors held a book signing for their most recent works, Ed Bebee for Invisible Army and Ken W. Watson for Tales of the Rideau. The Roadshow is an important part of our annual programme, enabling us to meet members and to talk with a broader audience, sharing our message about the charm, heritage and importance of the Rideau Waterway. It also provides opportunities for us to showcase our publications and the array of t-shirts and caps adorned with the Friends logo, plus other desirable items which we have for sale. We find from time to time that we sign up a new member or two, which is always a pleasant experience. At the Rideau Canal Festival, where Friends’ booth was at the foot of the stairs from Confederation Square to under the Plaza Bridge, Ed Bebee had the pleasure of talking with Col. John By himself, also known as Alan Meltzer, and after providing him a copy of Invisible Army was able to ask the Colonel how he felt the Canal had been cared for since he finished his work in 1832. The Township of Rideau Lakes and the Township of Leeds and Thousand Islands are sharing some of their rich history with the world in the form of a digital image collection. The libraries in these townships have been working over the last year to preserve, organize and share these items, including correspondence, photographs, deeds, diaries, maps, recording, local history and more. Enter a search term (i.e. Rideau) and when the results come up, click on the thumbnail image. When the listing comes up, click on the smaller photo to bring up a full sized version. 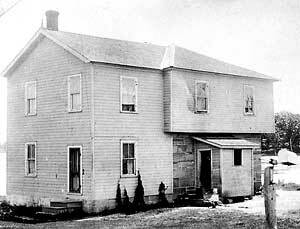 A few years ago the Merrickville District Historical Society digitized much of their archival collection. This year they partnered with the Merrickville Library and the Lions Club to make this digital collection available at the library. This has been successfully completed and now anyone who wishes to see these archives simply has to make use of a computer in the Merrickville library. On a soft summer evening in the 1830s, a lockmaster and his staff lounged around smoking their pipes, chatting and quaffing fine 3 week-old whisky and beer. After a while, the lockmaster raised his hand to stop the banter. As befitted his age and rank, he felt it necessary to introduce the men to some of the higher things in life, such as an appreciation of literature. With a judicious choice of author, he might also hope to bring some of the younger men to recognize and accept why things were as they were. Railing against the establishment was not only unwise but demonstrably wrong! Miss Austen’s well-known and interesting work, Pride and Prejudice, was the ideal choice. It showed the constraints that army officers laboured under with low salaries for low-ranking officers. If they had little or no social standing, promotion and marriage prospects were poor or non-existent. Much the same was true of lawyers, who were somewhat less respectable than army officers. The clergy had the same prospects. No doubt about it, boys – no bed of roses. The lockmaster was familiar with the intemperate outbursts of the youngsters, who railed against the unfairness of it all. His clinching argument was always the same – God’s design of creation was calculated to bring about the general happiness and well-being of the labouring man, and this was clear in the social and physical order of things. 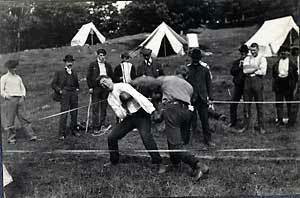 In fact, even pagans knew this – the Romans extolled the strong link between the army and discipline. A man’s lot in life is fixed – be content with that. Over time, there were many authorities that the lockmaster brought to bear on the objectors. The genial churchman, William Paley, was comfortingly clear that the world was unfolding just as God intended. Malthus could be relied upon to show that unbridled appetites among the working classes had made their struggle for existence more severe, since their labour was all that they had to sell to provide subsistence. Among the lock staff, there were those who glimpsed that the old economist, Adam Smith, might have been right after all to emphasize the importance of specialization of functions and division of labour, making it possible for those with above-average skills to prosper. The lockmaster puffed on his pipe and remarked sagely that with some self-restraint, a man could do well in this country and have reasonable expectations of some of the comforts and decencies of life. The lockmaster borrowed books from the local Church of England clergyman that showed an iron link between the labour of the working class and the accumulation of wealth by property owners. The development of the arts and sciences was made possible through the far-sighted use of the surplus. In his informal seminars, the lockmaster praised the efforts of men such as John Beverley Robinson, who promoted tirelessly a modified British social and educational system to deliver such benefits for Upper Canada. Over time, things changed. The increasing use of machinery, coupled with specialization, the spread of the railways and freer trade, changed the balance between agriculture and industry along the Rideau Corridor. The rise of salaried managers marked the shift away from personal supervision by owners, but did nothing to make working life any easier. In fact, such managers could push harder, since they had a single focus. Friends of the Rideau would like to thank the Long Reach Association for its donation this summer, and to Gillian Organ, staunch member of both the Association and Friends, for keeping us in mind as being worthy of support. Thanks also to Apollo Computers of Smiths Falls who loaned us the big flatscreen TV for use in The Depot. They also helped with preparation of the photo presentation, featuring scenes of the Rideau Waterway, which ran on the screen all season. Thank you Apollo Computers for your support. A series of paddling guides, created by your editor, has just recently been posted to the Friends of the Rideau website. It’s part of our on-going efforts to provide the tools people need to fully appreciate the natural and cultural heritage of the Rideau Canal. In this case the tool is a set of detailed planning guides which will encourage people to get out on the water – to appreciate the ecological beauty of the Rideau and see, first hand, our rich cultural heritage. Key to each guide is a 1:50,000 scale map (when printed to 8.5” x 11”), that, in addition to the text, will allow people to easily plan a paddling trip to any section of the Rideau. Since the constraint of each guide is the area covered by the map, it has taken 18 guides to detail both the Rideau Canal and the Tay Canal. That design was done with the day/weekend paddler in mind, since the Rideau is an ideal place to do such trips (in most cases, 1 guide equals at least 1 day’s paddling). Those doing all or part of Rideau as a longer paddle can simply get the number of guides they need to cover the section they wish to paddle. The information in each guide includes items specific to the section covered by the guide: water access (where can a paddler get in and out of the water), a description of the waterway covered by the guide, travel distances, a list of the points of interest a paddler might see (including a bit of history), suggested side trips, a list of common flora and fauna a paddler might spot along the route, and more. The guides are available as both a web page and as a downloadable PDF file. The advantage of the PDF is that the user can zoom in on the map to see any level of detail they desire and use this as an aid to route planning. The PDF is also meant to be printed so that the paddler can take it along on their journey of Rideau exploration. In conjunction with the guides, a section dealing with the fauna of the Rideau (the wildlife a traveler might see on their Rideau journey), including a number of pretty pictures of wildlife, has also been posted to the website. The guides will continue to evolve over the winter as more ideas for additions/clarifications come along. Ken and Friends will also be mulling over other options (i.e. hardcopy) to do more with the guides. To have a look at the guides, head over to www.rideaufriends.com and click on the link for Paddling Guides. In July, Parks Canada announced a new initiative that will add new canoe/kayaks docks, ramps and signage to the Rideau Canal lockstations. The floating docks will be put in place at the top and bottom of each lockstation. These are supposed to be in place in time for the 2011 boating season. This is a great initiative on the part of Parks Canada to make it easier for paddlers to enjoy the Rideau Canal. After minor spring and summer diversions, including Tales of the Rideau (see front page) and the Rideau paddling guides (see this page), FoR Publication’s chair, Ken Watson will be back to work converting more Parks Canada manuscript reports into books on CD. The first one on deck is Manuscript Report 423, “Industries and Industrialists of Merrickville, 1792-1979” done in 1979 by Richard Tatley. It is an extensive 3 volume report. The hard slog of doing the OCR work (converting the paper copy to editable digital text) was done by FoR volunteer Alec Rait. My hat is off to Alec for his hard work in this regard – he did a great job of OCRing the entire 3 volume report. Many thanks Alec!! Once in Book on CD form, it will join the seven others we’ve already completed (see our website for these).